Still Water has an “oracle reading” each year at our New Year’s Day brunch. First we ask a question to ourselves about how we want to be in the new year. Then we pick a card from a deck of 81 cards, each card containing one chapter of the Tao Te Ching. The sentence delighted me because it so succinctly addressed an issue that has dominated much of my life. My principal orientation, from at least the first grade, was to compare and compete. I felt safe, valued, when I considered myself better than others at something, or at least as good as. Or, as was often the case, I felt fearful, empty, when I considered myself not as good as others. I wanted to be like those I admired, and leave my inferior self behind. Mindfulness practice offered me a radically different way to be in the world. First, by directing my attention to the many uplifting moments in my life that didn’t depend on comparing and competing, such as a pleasant breeze or the smile of a friend. And second, by gradually and radically altering my understanding of who/what I was and and who/what others were. In the old view I saw myself like a marble in a jar of other marbles, many of which were better shaped and more beautiful than I. In the new view, I saw myself like a cloud or a leaf, shaped by the conditions that had brought me into existence. A day from now, a year from now, I would be shaped into something else. The physicist David Bohm has a beautiful phrase for this sense of an ever-changing and self-less world: “Undivided Wholeness in Flowing Movement.” Who/what is there to compete with? A color is made only of other colors. Looking deeply into one color you see all the other colors in it. The color white is made of non-white elements; this is a scientific fact. The color brown is made of non-brown elements. The color black is made of non-black elements. We inter-are; that is a fact. You are in me and I am in you; it’s silly to discriminate against each other. It is ignorance to discriminate, to think that you are superior to me or that I am superior to you. Because many of us have suffered, we may feel that we are inferior and without value. The teaching of the Buddha can help us to attain the wisdom of nondiscrimination that can free us from this inferiority complex. We may also have a superiority complex that makes us think we are better than others, or an equality complex that makes us always need to be exactly the same as everyone else, even when that doesn’t make sense for the situation. According to the teaching of the Buddha, we cannot compare because there is no self to compare and nothing to compare with. The right hand and the left hand don’t have a separate self. We can’t compare, and shouldn’t try to compare; when we see this, we don’t suffer. This Thursday evening, after our meditation period, we will explore together our experiences with the three complexes. Have comparing and competing created suffering in your life? Has mindfulness practice helped you live with more serenity and comfort? Below are several more paragraph on the Three Complexes from Together We Are One, and also, the complete Chapter 8 from Stephen Mitchell’s translation of the Tao Te Ching. As is our tradition on the first Thursday of the month, This Thursday we will also offer a brief newcomer’s orientation to mindfulness practice and to the Still Water community. The orientation will begin at 6:30 pm, and participants are encouraged to stay for the evening program. If you would like to attend the orientation, it is helpful if you let us know by emailing us at info@StillWaterMPC.org. In Buddhism, all complexes are born from the notion of self. If we think we are superior to others, we suffer from a sickness. The ground of our sickness is our illusion of a self that is “better.” Many of us struggle to prove that we are better, more powerful, more intelligent than others. This is craving, and it is born from ignorance. We seek happiness by trying to prove that we are superior. All of our life we try to demonstrate this one thing: I am superior to you; my nation is superior to yours; my race is superior to yours. We want to prove that we are the number one power, and that we can militarily overpower and defeat any nation: “I am superior to them; my nation is the mightiest nation.” This feeling gives us some satisfaction. And when the other side suffers, they have the impulse to respond in the same way. They want to say: “Were not nothing! We are something! If you strike us, we can strike you back another way. If you bomb us, we can carry a bomb onto a bus and blow ourselves up. We can make you sleepless; we can make your nation live day and night in fear.” They try to retaliate, to prove that they are something, that they are not nothing. Both sides are trying to do something to punish, to show they are superior. That is happening with many groups, whether Palestinian or Israeli, Hindu or Muslim. We want to prove that “we aren’t nothing, we are worth something, you cannot look down on us!” All that kind of striving is based on the illusion of self. In fact, we inter-are. If you suffer, we suffer also. If you are in safety, we will be in safety also. Safety and peace are not individual matters. If the other person is not safe, you cannot be safe. If the other person is not happy, there is no way that you can be happy. Look at any couple. If the father is unhappy, the son has no chance to be happy. If one partner is not happy, it’s very difficult for the other partner to be happy. Happiness is not an individual matter. We have to see the interbeing nature of things. When we make the other person happy, we have a chance to be happy also. That is why the insight of interbeing is the ground for peace and happiness. We have to touch the ground of our interbeing and help him, help her, to touch the ground of interbeing, and then discrimination will vanish. The complex of superiority brings a lot of suffering to us and to those around us. When the other person or group suffers from an inferiority complex, they struggle and they make us suffer. According to the Buddha, the complex of superiority and inferiority are both sicknesses based on the illusion of self. In addition, needing to consider ourselves equal to someone else is also a sickness. “Well, I am as good as you are, and I will prove it.” That will also cause a lot of suffering. Whenever we think there is a self, we compare and compete. Buddhist psychology is a little bit different from Western psychology. Instead of trying to build self-esteem, Buddhist psychology is based on the wisdom of nonself and interbeing. When we remove the notion of self, we are free from inferiority, superiority, and equality complexes, and we can find peace, reconciliation, brotherhood and sisterhood. Around us there are many people with power, wealth, and fame, who suffer deeply from loneliness and despair, and many of them commit suicide, while people who have understanding and compassion don’t have to suffer at all. They can live happily because they are protected by their wisdom and their compassion, and they don’t have any kind of complex. The Buddha was a human being like us; he’s not a god. He suffered, he practiced, and he was able to transform himself. He was also able to transmit the wisdom of interbeing and nondiscrimination to us. With that wisdom we can liberate ourselves and help liberate the world through our practice. We can live without any complex, whether of superiority, inferiority, or equality, because there is no self. To be a lotus flower is wonderful. To be a magnolia flower is also wonderful. In the lotus there is a magnolia. In the magnolia there is a lotus. 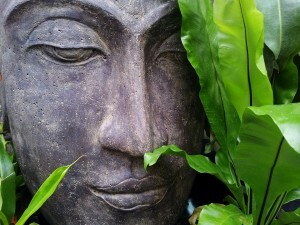 Not only do we need to let go of our notion of “self”; we also have to remove our notion of “human.” The Buddha told us that humans are made of non-human elements, namely animals, plants, and minerals. If the human being is aware of the fact that she is made only of non-human elements, she will know how to protect the life of animals, plants, and minerals, and she will not exploit, pollute, and destroy them. She knows that to protect the realms of animals, plants, and minerals is to protect the realm of humans.